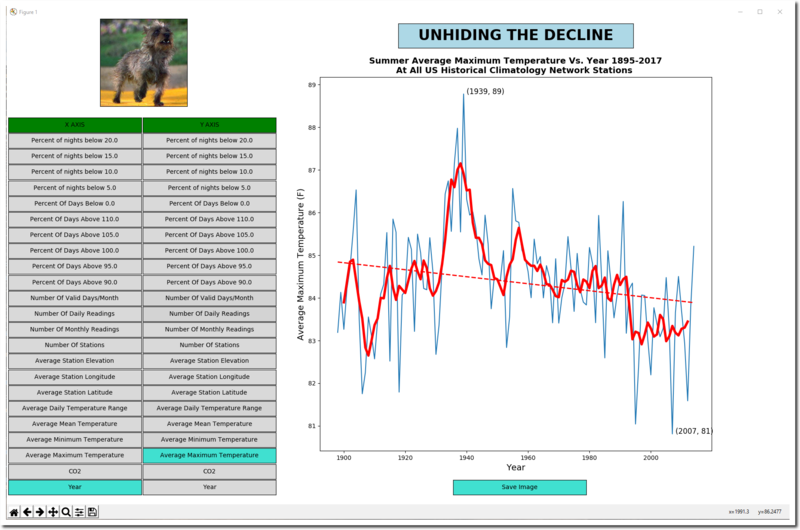 This is the initial release of my new GHCN software, titled UNHIDING THE DECLINE. It is designed to allow you to process large GHCN databases on a small computer with little memory, and make graphs very quickly. The initial release is just for people who have python available. This includes any Mac or Linux user, and any Windows user who is willing to make the effort to install python3 and a gnu environment like cygwin or mingw. I will release a Windows exe file soon. You can generate hundreds of different graph types very quickly by simply clicking on an X-axis option (left column) and Y-axis option (right column) . Click on the “Save Image” button to create a .png file, which is in the same directory you ran the ghcn.py script from. It also generates a csv file in that directory with all of the stats. To update the USHCN database, change the permissions on the bash get script, and run it “./get” . That will create a new US.txt file. If you find any bugs, let me know! There may well be some. I just started this project last weekend. I’ve been at this for 12 straight hours and need to get out on my bike!